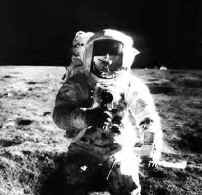 This miles tall anomalous structure on the moon was photographed by cameras on the Apollo 11 Command Module and by the Russian Zond Satellite. This fact rules out film defects or dirty lenses. Reflection in upper right of Astronauts visor appears to be the Lunar "Castle". 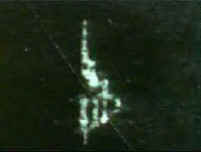 According to Richard Hoagland, NASA computers were used to place this structure at the same site as the Lunar "Castle".